LANSING, Mich. — Sen. Dale Zorn on Thursday supported a boost in current-year funding to make critical school safety improvements and help prevent school tragedies. The funding is included in Senate Bill 601, a supplemental appropriation bill for the current 2018 fiscal year. Grants would be available to public and nonpublic schools to purchase physical security equipment or a school safety assessment. The system app would allow authorized users to call 911 while simultaneously providing alerts to school staff and area first responders via text message, email and push notifications. SB 601 also features an additional $500,000 to promote Michigan’s OK2SAY hotline and $150,000 for the Michigan State Police to add staff for the program. The bill is part of a comprehensive Senate school safety effort that includes Zorn’s bill to ensure law enforcement officers in Michigan have the training needed to effectively manage an active-shooter situation at a school. Senate Bill 959 would require the Michigan Commission on Law Enforcement Standards (MCOLES) to develop statewide training standards for active-shooter situations in schools. 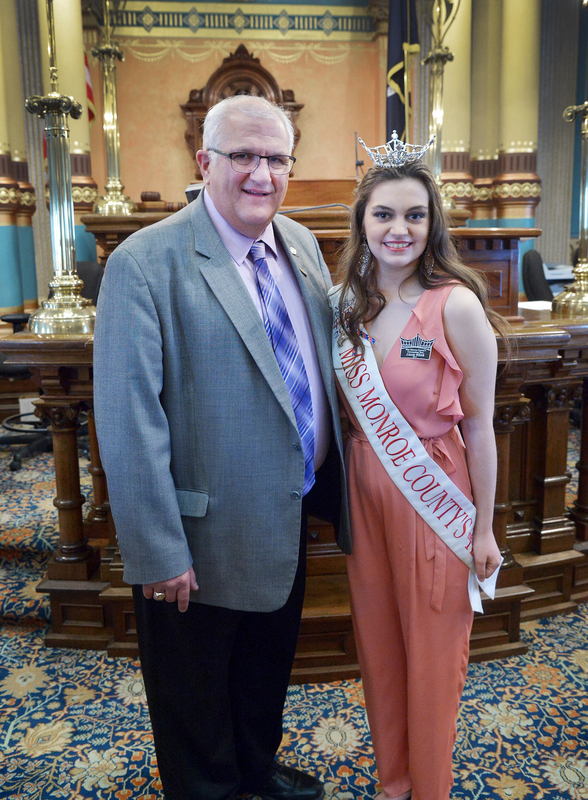 LANSING, Mich. — Sen. Dale Zorn, R-Ida, welcomed Miss Monroe County Outstanding Teen 2017 Elizabeth Wirth of Ida to the Michigan Capitol on Tuesday. Wirth is autistic and her competition platform was “M.A.K.E. a Difference — Making Autism Known to Everyone.” She was at the Capitol to meet with Zorn and Lt. Gov. Brian Calley during National Autism Awareness Month. The Great Lakes are the world’s largest surface freshwater system and provide clean drinking water to nearly 40 million people. It is our responsibility to protect this great natural resource, and the federal Great Lakes Restoration Initiative (GLRI) is a critical part of that effort. I was pleased the president signed a bipartisan budget agreement that includes vital funding to protect and improve the Great Lakes. The GLRI supports important efforts to clean up toxic sites and restore natural habitat. It is also an essential resource for preventing the introduction of Asian carp into the Great Lakes and eliminating harmful algal blooms in Lake Erie. Prior to passage of the budget agreement, I joined 63 members of the Great Lakes Legislative Caucus (GLLC) in expressing support for the GLRI and urging Congress to continue fully funding the initiative. In our letter, we noted that Congress passed legislation in 2016 authorizing the GLRI for five years at $300 million per year and urged the current Congress to follow through on that commitment. The GLLC is a nonpartisan, binational organization of state and provincial legislators from eight Great Lakes states and two Canadian provinces. The bipartisan group co‑signing the letter represented all eight states in the Great Lakes region. The Michigan Senate recently approved legislation to allow residents to register to vote online. This reform would help more people participate in the democratic process while maintaining safeguards against fraud. Using technology to improve the voter registration options is good for everyone. It would save time for people registering to vote, and other states that have enacted similar reforms have seen reduced administrative costs and increased accuracy in the voter rolls. Senate Bills 425-429 would direct the secretary of state (SOS) to develop and maintain an electronic voter registration interface that would allow residents to submit voter registrations on the SOS website. To register to vote online, residents would need to have a valid driver’s license or a state personal identification card. The electronic system would be required to transmit the application to the qualified voter file and be able to interact with the state personal identification card and driver’s license files for authentication. At least 37 states have enacted some form of electronic voter registration law. Online voter registration would basically follow the same process as the current paper-based system. With proper verification measures in place, it can be a safe and secure way for residents to register to vote. LANSING, Mich. — Sen. Dale Zorn on Thursday introduced legislation to ensure law enforcement officers in Michigan have the training needed to effectively manage an active-shooter situation at a school. The Michigan Commission on Law Enforcement Standards (MCOLES) has a mandated Active Duty Firearm Standard for all law enforcement agencies in the state. Currently, that standard does not include responses to active-shooter situations in schools. Senate Bill 959 would require MCOLES to develop statewide training standards for active-shooter situations in schools. The training would be required to at least include scenario-based instruction involving 360-degree security, formation training, building entry and coordination of rescue and first responder teams. “Training and preparation can save lives,” Zorn said. “When it comes to protecting our schools, it is critical that students, school staff and law enforcement all know what to do to prevent a tragedy and how to respond if a situation occurs. SB 959 was referred to the Senate Judiciary Committee for consideration. 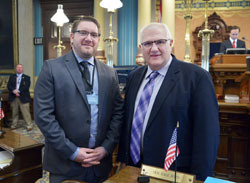 LANSING, Mich. — Sen. Dale Zorn and Sen. Vincent Gregory have introduced bipartisan legislation to allow a county prosecutor to bring charges in the drug-overdose death of a resident in the county, even if the illegal drugs were purchased in another county. “This legislation is the result of a case involving the death of a Monroe County resident and would give prosecutors more tools to punish drug dealers,” said Zorn, R-Ida. In a recent case titled, People v. McBurrows, the Michigan Court of Appeals ruled that charges of delivery of a controlled substance causing death can only be prosecuted in the county where the drugs were delivered. LANSING, Mich. — Sen. Dale Zorn, R-Ida, welcomed the Rev. Josh Ellis to the Michigan Capitol on Tuesday. Ellis serves as senior pastor at New Life Church in Petersburg and delivered the invocation before Senate session. Video of Ellis’ invocation is available by clicking here or by visiting www.SenatorDaleZorn.com/Video. LANSING, Mich. — Sen. Dale Zorn has announced that he will conduct district office hours in Adrian and Monroe this month. The Adrian office hour will be held on Monday, April 23 from 5:30 to 6:30 p.m. at the Adrian District Library, 143 E. Maumee St., in Adrian. The Monroe office hour will be held on Monday, April 30 from 5:30 to 6:30 p.m. at the Ellis Library & Reference Center, 3700 S. Custer Road in Monroe. Residents who are unable to attend the office hours may contact Zorn’s office at (517) 373-3543 or via e-mail at SenDZorn@senate.michigan.gov.